Hair 4U 10% Solution helps to strengthen the hair follicles. It is the topical treatment for androgenic alopecia or male pattern baldness. It is not suitable for use by women with female pattern baldness. It fortifies the hair from the roots and helps to repair the split ends. It gets deeply absorbed into the scalp by providing nourishment to the hair. It cannot cure baldness, but can prevent the progression of hair loss in the frontal areas of the scalp as well as the vertex area. Hair 4U 10% Solution stimulates the longer hair follicles to initiate new hair growth. Shop it online from The Health Tree with huge discounts. 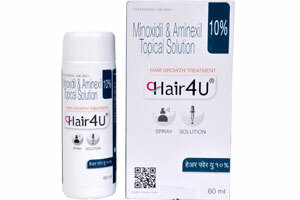 Indications: Minoxidil is used in the treatment of?high blood pressure. Minoxidil is a vasodilator. It works by relaxing blood vessels, allowing more blood and oxygen to reach the heart and other organs. This lowers the blood pressure.